Jesse Epp-Fransen writes about the the Hunger Report put out by Bread for the World and the need to refocus farm policy on producing healthy food and supporting small- and medium scale farmers in the latest Mennonite Weekly Review. 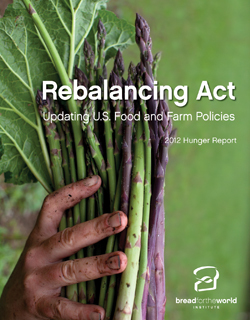 The 2008 farm bill is expiring and will need to be reauthorized this year. This is a chance to put the focus of farm policy back where it belongs, on supporting farmers to produce the food we all need for healthy bodies and healthy lives… A farm bill is an opportunity to build justice, health and economic stability. This could be a chance to work for the healing of the nations. Read the entire article here and then let us know what you think on facebook or in the comment section. The full 2012 Hunger Report is available at Bread for the World.